If you are looking for the Texas Holdem Rules, you have come to the right place. Texas Holdem Poker is a community card game generally played from anywhere between 2 to 10 people. To win in Texas Holdem Poker, you will have to make the best 5 card combination possible (check out the Hand rankings overview). The person who starts dealing the cards to all players is called the dealer and is determined by pulling the highest card from the deck (before starting up a game). The first two players next to the dealer put in a small and a big blind (for instance 1 cent and 2 cents). This is to make sure the action gets started and people don’t just wait to be dealt Ace Ace (the best starting hand in Texas Hold Em). Once the small and big blind have been completed, the dealer starts dealing in a clockwise motion, until every player has received 2 cards faced down. Fold: You throw away your two cards (your hand) without investing any more in the pot. Call: You stay in the hand by matching (calling) the big blind bet. Once everybody has made up their mind and the first betting round has completed, the dealer lays out The Flop. The flop consist of 3 random cards dealt from the top of the remaining cards in the deck (that weren’t dealt out to the players). The flop represents the 2nd betting round. The first player to the left of the dealer is first to act (note that if the small blind is still in the game, the player will always act first in the remaining betting rounds). After all betting action has completed on the flop, the dealer turns over a 4th card, which is called The Turn. This turn card initiates the 3rd betting round. Again the player left of the dealer starts the action by either folding, checking or betting. This goes on until all players have completed the betting action of the 3rd round. 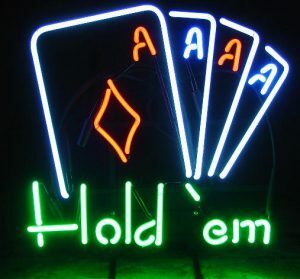 After the turn has been dealt and the betting has been done, the dealer lays out out a 5th card which is the final card in Texas Holdem, known as the River. This is the 4th and final betting round. Again the remaining players get the chance to either fold, check or bet one last time. Once all the betting has been completed, the remaining players reveal their 2 unexposed cards (Hole Cards) starting left from the dealer. Each player now shares the 5 cards that are on the table (community cards a.k.a. The board), but can make higher combinations when using either both or just one of their 2 hole cards (in combination with 3 or 4 open cards from the table). The player who makes the Highest 5 card combination wins all the chips that were put into the pot during the 4th betting rounds. These are the basic rules of Texas Holdem poker. You can find more specific Texas Holdem rules in our poker rules section. Also make sure you take a look at the Hand Rankings overview to make sure you always have the winning hand when playing Texas Holdem Poker.